Craving something sweet, crunchy, and salty? This no baking required, quick and easy dessert is fun to make and won’t leave you feeling guilty! 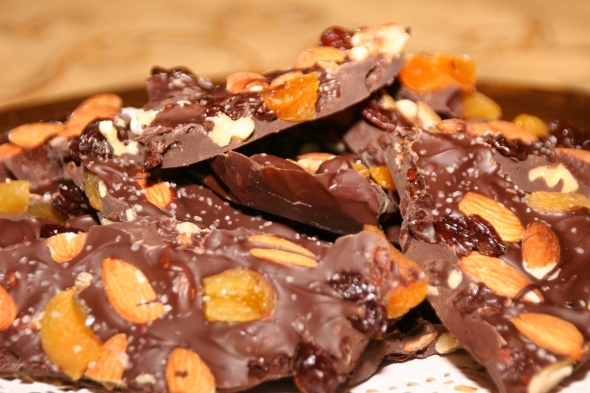 It’s made with bittersweet chocolate, raw nuts, and dried fruit. Good ingredients for a nutty chocolate bark that’s so delicious! Line a 13x9x2 inch baking pan with aluminum foil with enough to hang over sides. Mix toasted nuts and dried fruit in a small bowl. Melt bittersweet and milk chocolate chips in a medium bowl over saucepan of simmering water, stirring frequently until melted and smooth. Remove bowl from heat and quickly mix half of the nut and dried fruit mixture into the melted chocolate. Pour melted chocolate mixture into prepared foiled baking pan spreading evenly and smooth. Scatter remaining dried fruit and nut mixture evenly over chocolate. Using a sheet of wax or parchment paper gently press mixture down so that the fruit and nuts are slightly sunk in evenly. Sprinkle entire top with kosher salt. Cover and chill until chocolate is very firm, about 1 hour. Peel off foil and break into irregular pieces.